The holiday season is upon us and whether you’ve got guests coming, office parties, or even neighborhood “cookie” exchanges, these quick and easy minis are great for nomming and sharing. 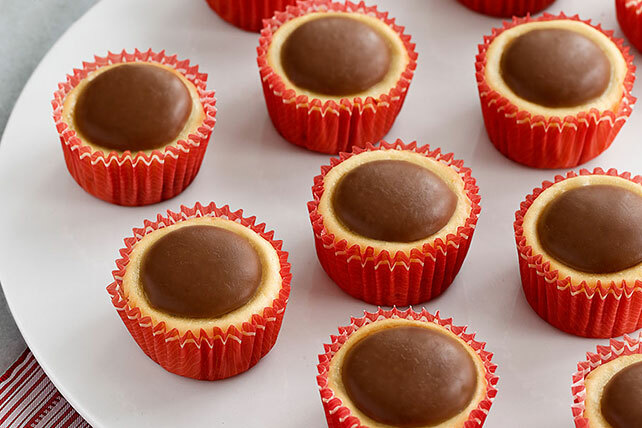 Discover these Two-Bite Mini Cheesecakes Recipe, from Kraft. The recipe is ideal for potlucks, parties, dessert tables and more. This mini cheesecakes recipe is big on flavor. Place 1 cookie, flat side down, in each of 24 paper-lined mini muffin cups. Beat cream cheese, sugar and vanilla with mixer until blended. Add egg; beat on low speed just until blended. Spoon over cookies. Bake 13 to 15 min. or until centers are almost set. Immediately top with chocolate pieces. For more information and nutritional values, CLICK HERE. This entry was posted in Writing Life and tagged characters, food, holiday, Moonstruck, recipe, Tuesday Treats. Bookmark the permalink. Sigh. Yesterday I was signed in. Today the computer isn’t and I don’t remember my password.